Lake William Hovell is another little discovered destination in the King Valley that is worth a visit especially for families on a warm summer’s day. The Lake is located on the King River Road approximately 18km south of Cheshunt. It is well sign posted from Whitfield. 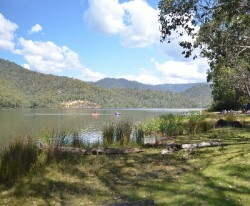 The Lake was completed in 1974 and is named after the early Australian explorer, William Hovell. It is managed by Goulburn Murray Water. The Lake supplies water for a variety of irrigated properties located along the King River all the way through to Wangaratta. It is a relaxed location with picnic facilities including BBQ and Toilets as wells grassed sitting areas, ample car parking and a boat ramp. It is safe for swimming and fishing with a good selection of shaded areas to set up for the day.